One of the biggest failings of the US press in recent months, in the run up to their election and since Donald Trump’s shocking win, has been not only a failure to highlight when Donald Trump has been telling lies but to often repeat his comments verbatim, as if they were the truth. 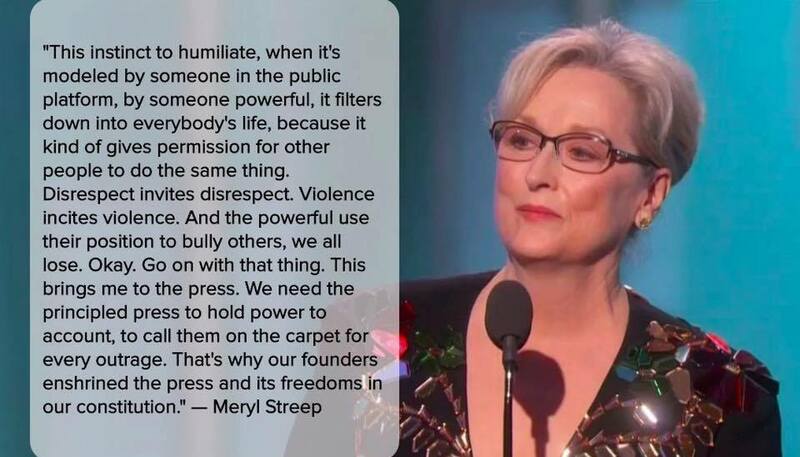 When Meryl Streep accepted the Cecil B. DeMille Lifetime Achievement Award at the Golden Globes on Sunday, 8th January 2017, she gave a passionate speech that called out Trump’s bullying behaviour, plus asked the press to hold power to account. She didn’t mention Donald Trump by name. She didn’t need to. Wonderfully powerful stuff from Ms Streep. We salute her. Watch Meryl in action, then read the full transcript of her speech. This entry was posted in America, Film, Latest News and tagged America, Awards, Donald Trump, film, Golden Globe, injustice, media, Meryl Streep, press, television, US. Bookmark the permalink.